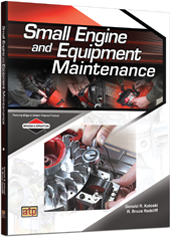 Small Engine and Equipment Maintenance is a comprehensive compilation of small engines and the maintenance practices that are required to maintain the efficiencies and durability of residential and commercial power equipment. The materials have been designed to support an entry-level small engines program and a small engines owner looking to prolong their power equipment investment. Quick response code technology is incorporated throughout that references easy-to-understand procedures and identifies critical operation components. The learner will reference this well after they leave the classroom.